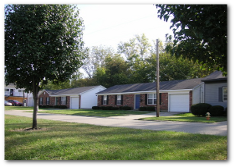 Two and three bedroom houses, located on a scenic wooded creek bank, where ducks are frequent visitors! (Rental houses have limited availability). This cozy two bedroom home has clothes washer / dryer hook ups, a large eat in kitchen, a full size basement, and a fenced, gated back yard. These spacious homes offer a contemporary floor plan with lofted living room ceiling, laundry room with clothes washer / dryer hook ups, abundant closet space, large eat-in kitchen, fenced in, gated back yard and a one-car garage with garage door opener and additional storage in the attic. Conveniently located on the bus line. Senior citizens pay a reduced rental rate and deposit. This is for all our residents age 55 years and up! $150 non-refundable pet fee and $20 additional rent for pets. Lawn mowing included! Have you seen that included with other rental houses? Let us mow your lawn and make home repairs! Office Hours: Monday through Friday 8:30 a.m - 5:00 p.m.
Additional photos of this property are at the bottom of this page.